If it's not alive, we can frame it! We highlight framing projects that are special/fun/unusual in our monthly email newsletter. Sign up for our newsletter to read about these projects, our latest gallery shows, and other news from the shop. 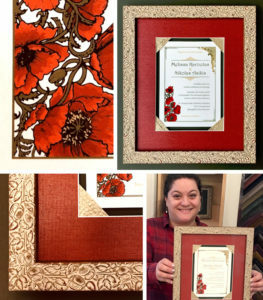 Do you have a unique or treasured item you'd like to to protect and preserve with a custom frame? Contact us, we're happy to design something special just for you! 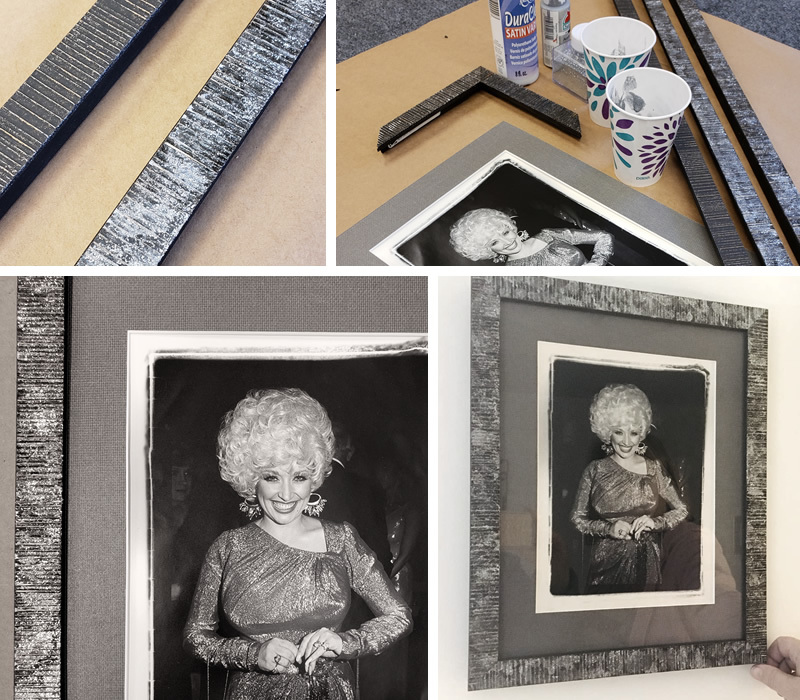 This month the Queen of Country, in photo form, arrived in the shop in need of extra sparkle. The frame our customer chose was not quite special enough... so Dan set to work on a magical mixture of glitter, silver paint, satin varnish and lots of love. The end result was a frame befitting dear Dolly and our customer was thrilled. 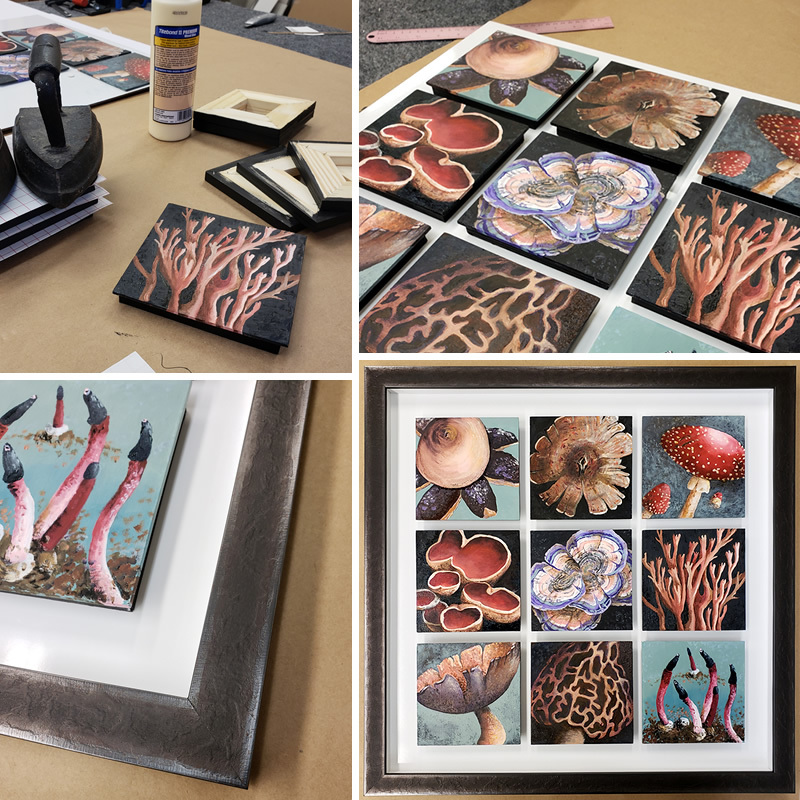 These 5.5" square panels were painted by local artist and longtime customer Sally Dillon. We mounted the panels to pine strainers to add depth, then arranged them in a grid and attached them to a contrasting white panel board. 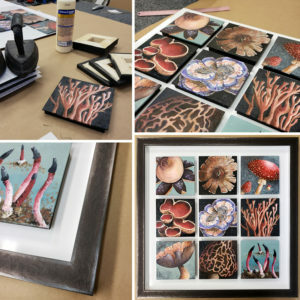 The arrangement was finished with a textured earthy brown frame to compliment the mushrooms and the earthy brown hues in the pieces. This is one in a series of square pieces Sally has done this way and we really like the effect. Melissa, our printmaker, got married last year and we just got the chance to frame her beautiful wedding invitation. The invitation was printed by the bride on Hahnemule German Etching paper on our in-house Epson printer. We chose a poppy red linen mat, and used some of the decorative gold paper from the invitation as accents in the corners. It's framed with a floral carved frame which perfectly compliments the ensemble. We're so happy to help Melissa preserve this memory. συγχαρητήρια! Hamilton! This keepsake was a grandfather’s gift to his granddaughter. The poster was signed by the entire cast. There were some cast changes that evening, so we scanned the playbill cast list and did some photoshop magic, et voila, the framed version includes the cast changes. We added a gold metallic mat and Bella’s “Denim Crepe” Shimmy moulding to preserve this wonderful memory. 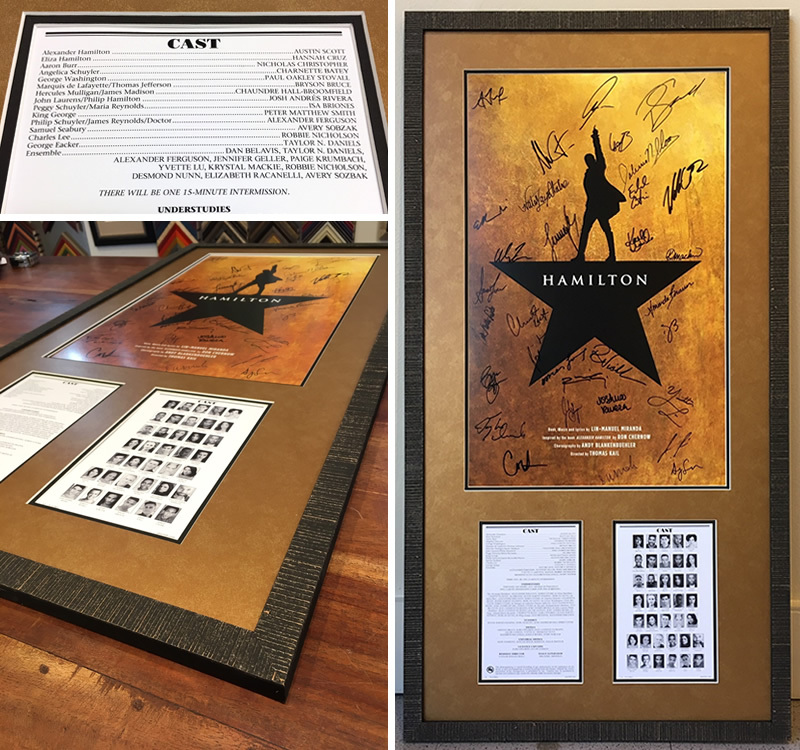 < Framing Project of the Month 2018 See more!